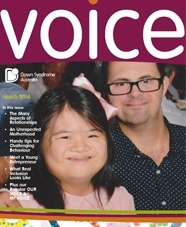 Voice is the members’ journal of Down Syndrome Australia. Issues are published in May, August and December. Subscription to the national journal is a membership privilege only, and is included in the Down Syndrome Victoria's membership fees. The target readership is member families of state and territory associations but the publication is expected to also be of interest to practitioners and professionals whose work brings them into contact with individuals with Down syndrome. Throughout each 32-page issue the content focus is only on matters relating to people with Down syndrome or issues of intellectual disability. The feature articles are written, where possible, by acknowledged experts in the field—edited if needed to plain English. The feature section also includes other articles and information relating to the feature theme. Supplementary material can be articles relating to other issues of particular interest to members, in order to respond flexibly to current affairs issues and include unsolicited material of interest to members. Each issue also includes 'topic related' contributions from families and individuals with Down syndrome, and can include material reprinted from other sources with appropriate acknowledgement and permission. The rest of the journal includes state and territory news and information, reviews of current and new publications and new technologies. Go to the Voice webpage to subscribe.